Just after the computer system shuts down which signals that the exam is over. The system sends back the results to jamb database within minutes for marking and it takes few minutes for the software to automatically mark the result, compile and assemble it. It will interest you to know that jamb don’t manually mark results unless in some special cases, if they do it will take months to get every Paper marked. They understand this challenge and they also understand that the quicker they releases results the better it is for everyone. 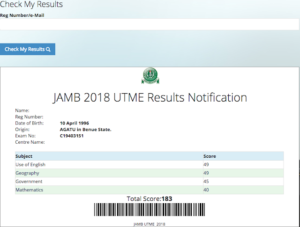 The Joint admission and Matriculation board JAMB makes use of software to mark all results, this software is highly accurate and have been proven to be error free once everything has been put in place. The Joint admission and Matriculation board jamb has assured the general public, candidates and stakeholders that results will be released 30 minutes after the exam. They hinted on a plan where they will notify candidates of their score either via email or via SMS. Please note that some result might be delayed due to certain factors in this case you have been ask to exercise patients for some time. checking the 2019/2020 JAMB Result after an exam becomes the next step every Jamb candidate should look towards to. This will show them how they have performed and their various chances they stand in the forth coming post UTME screening exercise and Admission process. The 2019/2020 JAMB Result has been concluded and after releasing the result JAMB won’t ask you to buy a scratch card. Previously candidates bought result checker card just to check their result but with the introduction of vending system JAMB eliminated all forms of card. Checking your jamb results requires you to log on to JAMB portal immediately the result is release. You will have to supply your JAMB registration number and in some cases other details which we are going to list here. Below are some details you will have to provide or supply to jamb before checking your result online. Every details you supply must match what is written on your jamb slip. The official portal for checking of JAMB result is www.jamb.org.ng. Jamb has uploaded or will continue to upload results that are ready on this portal. You have a limited number of times to check your result within the first few days, that is the tradition. JAMB allow candidates to check their result just 5 times within the first few days or weeks results has been published. You might even be wondering why will JAMB limit the number of time each candidate can check their result. In the very first week a lot of candidates will try to check their result over and over again. To free up space for others to check and to prevent the site from being slowed down jamb might employ this tactics temporarily then after some weeks you all can now be allowed to check the result any number of times you want. To check your JAMB score you must first supply your JAMB registration number. You need no serial number or any pin to check your JAMB result online. Note that your JAMB registration number always start with a capital letter. You will only need to insert your JAMB registration number in the space that appears. Have it in mind that you don’t need any scratch card before you can access your result, JAMB registration number is the main thing here, you can easily retrieve your score with just the number. Input your JAMB registration number in the space. And click on the check button. As you can see you don’t need to log in, only perform the 3 steps to get your results. Input your personal details like email address and password and click check result tab. Did you lost your JAMB registration number? If yes then log back to your mail to see if JAMB has sent you your result. Most candidates will get their result directly from their email. There is also an option to print it from the email. JAMB says nothing like scratch card, you should follow the process we wrote above to check your score right now. You can check the result your self or go to a business center to check and print your slip. Your JAMB slip won’t come with passport photographs, since it is just a slip and not the original result expect it to be plain with out a passport. Ensure you print out your JAMB result after checking it with out scratch card. Please note that any individual who sells or promise to assist you get a scratch card is a scammer, stay away from such people, JAMB has made it mandatory that you can only check your result with out scratch card. We understand that criminals will use this opportunity to scam candidates, most will offer you assistance to check your score or to even help you increase your score. Don’t fall for that old trick JAMB score won’t and can’t be increase by any body. Most people think that printing of JAMB result with out scratch card is impossible. Well that is very possible,but you have to understand that it won’t be possible to do that on your original JAMB result, you can only do that on your JAMB slip which will only show you your score. The Joint admission and Matriculation board jamb has released over a million candidate’s result who participated in the exam. Most candidates will be able to access their result via various options available to them. We have written down most of the options here just follow the one more convenient for you. Some candidates will get their results on their mail while some will get an SMS just note that you need only just 3 steps to check your jamb results online. There have been report of jamb candidates not able to locate their result online. It will be recalled that a sizeable number of candidates have declared their result missing or the system can’t locate their results. Immediately you get to find out your real JAMB score you will also need to print the original JAMB result that comes with a photograph of yours on it. Most schools will reject your jamb slip when coming to the post UTME screening exercise so it’s important you get the original jamb result in color not black and white. You will first login to JAMB efacility portal here. Scroll to the left side bar on your screen and click on “Print Result Slip”. Take note of a transaction ID that will be display on your screen. You need to make a payment for this which should cost you not more than 1000 naira only. Locate the “Pay Now” button and click on it. Choose the payment option best for you and pay but my favorite is the online payment option. Where you need only to input your card details and make the payment. Then proceed to check your results. Now that you are done checking your jamb results online and you have known your performance, we believe that your attention will now be shifted to your school of choice like trying to find out if you have been offered admission or not. 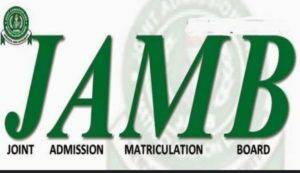 There are some schools that will conduct post UTME screening exercise while there are still many that won’t conduct screening so the best thing to do right now is to start checking if your name is now on JAMB admission list through JAMB CAPS portal. 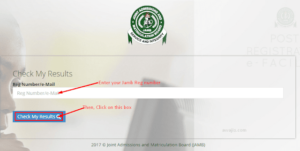 To check your jamb admission status through JAMB CAPS portal you will need to click here. You want to check your jamb mock result with speed of light? If yes let’s help you get this done with our special guide well reserved for you. Now you need to click on “Check Mock Result” to view your result.